In the past year, the media’s role as a player with interests in shaping the news, and not just a conveyor of news, has taken the spotlight. Think, for example, of Trump’s compulsive cries of “fake news” or Michelle Wolf’s White House Correspondents’ Dinner speech, which set off a firestorm of social media chatter and criticism. While the current administration was in the crosshairs, Wolff also took shots at the media, who “helped create” the president, “profiting off of him” in the form of increased ratings and newspaper sales. 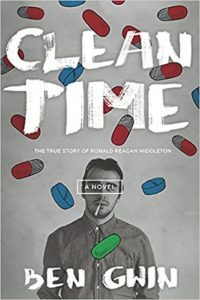 In his debut novel Clean Time: The True Story of Ronald Reagan Middleton, Ben Gwin similarly critiques the complicity of the media (and the experts it relies on) in shaping public narratives for financial gain. But instead of comedy, he draws on the strategies of metanarrative to recalibrate a beleaguered public’s attention to the far-from-impartial systems of representation composing our reality. Middleton’s on-the-books gig isans for the Jordache$Fitch clothing company: “Lunges and squats. Fifty lungs a pair, fifty pairs a day. After this, I’d use a melon baller and a hammer on each pair.” After work, Middleton hangs out with his girlfriend Jacky, and sells crystal meth “with a mysterious blue tint to it.” Things go south, though, when Middleton and Jacky are separated and thrown in jail. Middleton’s jail journals comprise a decent portion of the narrative. Prior to incarceration, Middleton had spent time at Guilford State University, working with the aforementioned Dr. Blank on a modern-day interpretation of The Odyssey. This connection is driven home time and again by Swanger, who interjects footnotes into the narrative to alert readers to events in Middleton’s life that replicate the Greek tale – and, if you believe the commentary, Middleton’s conscious decision to imitate The Odyssey by living it. Gwin’s metanarrative strategy recalls that of Vladimir Nabokov in Pale Fire. In that novel, fictional scholar Charles Kinbote comments on the poem of his deceased friend John Shade, and in doing so seeks narrative dominance. Swanger’s glib comments add poioumenon humor to the already absurd proceedings, and initially make Gwin’s novel a funhouse mirror in the same way as Nabokov’s. By including a character commenting on text, the original source material’s meaning is obfuscated by narrative commentary — we readers know that Swanger is scrambling to cobble together a degree-worthy dissertation and needs to find something in Middleton’s journals worthy of elevation to PhD status, whether or not there’s anything there. This degree-or-else agenda makes Swanger’s grafting of The Odyssey onto Middleton’s journals more difficult to swallow. Of course, this is all complicated by the fact that there’s occasional hay to be made regarding the comparison to Greek myth: despite Swanger’s desperation, points of comparison throughout the text do line up. Readers can’t dismiss Swanger outright despite feeling leery about the transparency of his academic motives. Gwin ups the ante by doubling down on the metanarrative. Nabokov’s Pale Fire mocks members of the academy, but its appeal is limited, based on its poetic and scholarly subject manner. In addition to providing a narrative framework based on (and similar to) Pale Fire, Gwin also skews the idea of distorting source material for profit and gain by training his lens on reality television. After a time, Middleton is reassigned to what he initially thinks is a normal drug rehab center. He’s half right — the rehab purports to be real, but it’s being held on behalf of a TV network called The Recovery Channel. Middleton says his treatment “was part of a contest for a new TV show called Clean Time . . . Me and the other addicts will be filmed around the clock. New episodes will air each week, with bonus footage streamed online every day. Apparently viewers can watch web clips and start voting before the first episode even airs.” The two addicted patients with the lowest scores each week are forced to fight in a segment called The Rehab Challenge, with the loser jettisoned from the show. The Recovery Channel adds another layer of narrative, and of possible confusion. Certainly the network’s agenda is to maximize ratings by creating a compelling product, and so the stated end result of rehabilitation for the addicts is immediately called into question by the presence of cameras and advertising, in much the same way that Swanger’s agenda is suspect. Add the fact that viewers vote to decide who stays — a vote based on likeability as much as effort to change — and the whole house of cards threatens to teeter and collapse. The individuals working through the steps of rehabilitation need to be honest in their self-appraisal, and conduct difficult, introspective work. Yet the contestants on Clean Time are being judged not for the work they do but how they appear onscreen, in direct conflict with the stated mission of rehabilitation. Rehabilitation would end the spectacle, so it’s in the best interest of the Recovery Channel to keep the contestants from doing the heavy lifting of self-work. In the midst of Middleton’s time on reality television, a series of murders take place, attributed to a serial slasher dubbed The Werewolf Killer by the press. The networks, of course, see the serial killings as an opportunity to provide content: they film and broadcast candlelight vigils for the victims and plan documentaries. As readers key into this subplot and begin to scrutinize the novels’ cast for possible perpetrators and agendas, the sensationalism of the media is again emphasized: discovering the Werewolf Killer might be good for the citizenry, but not good for ratings. As long as the spectacle remains, so will the coverage (and the cash). After escaping Clean Time, Gwin arranges to trade Jordache$Finch jeans for a signed rehab certificate, and reunites with Jacky. As Ronald Reagan Middleton begins to indulge in drink and drugs again, it becomes evident that the character’s evasion of rehab is a lot more work than the rehab itself. And then the journal entries end as Middleton disappears from the view of the public. In a sort of afterward, Swanger notes “that Ronald Reagan, as he gave in to his addiction, descended into the world of myth he’d been creating with Dr. Blank, back in the good old days of undergrad while working on his play” about the Odyssey. We’re left wondering about Swanger’s level of metacognition regarding the many layers of narrative. Perhaps Swanger knows that his readers are skeptical but is thudding along only out of a sense of obligation, trying to pass his thesis through a lazy, exhausted public incapable of more scrutiny. Or maybe his recounting is in complete earnest. Maybe he believes his own narrative. In the case of Pale Fire, it’s easy to see Kinbote as an active manipulator. The additional layers in Clean Time make the narrator’s role less clear. In addition to being hilarious and absurd, Gwin’s Clean Time is at its heart a novel concerned with boundaries. 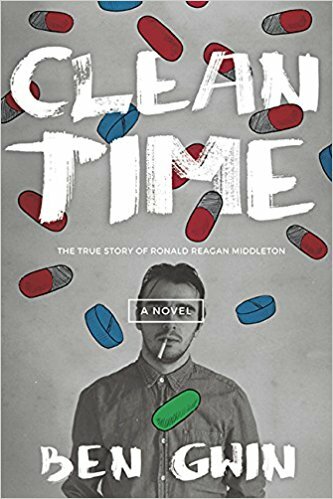 As the endless 24-hour news cycle increasingly feels like performance for profit rather than reporting, Clean Time: The True Story of Ronald Reagan Middleton rings true with its deft prescience. Michael T. Fournier is the author of Swing State and Hidden Wheel (Three Rooms Press) and Double Nickels on the Dime (33 1/3). He’s a regular contributor to Razorcake — America’s only non-profit punk zine — and his writing has appeared in the Oxford American, Vice, Submerging, Pitchfork,The Collapsar, Vol. 1 Brooklyn and more. Fournier and Maine poet Lisa Panepinto co-edit the broadsheet journal Cabildo Quarterly. He plays drums in and writes songs for Dead Trend. He and his wife Rebecca live on Cape Cod with their cat. More at michaeltfournier.org.